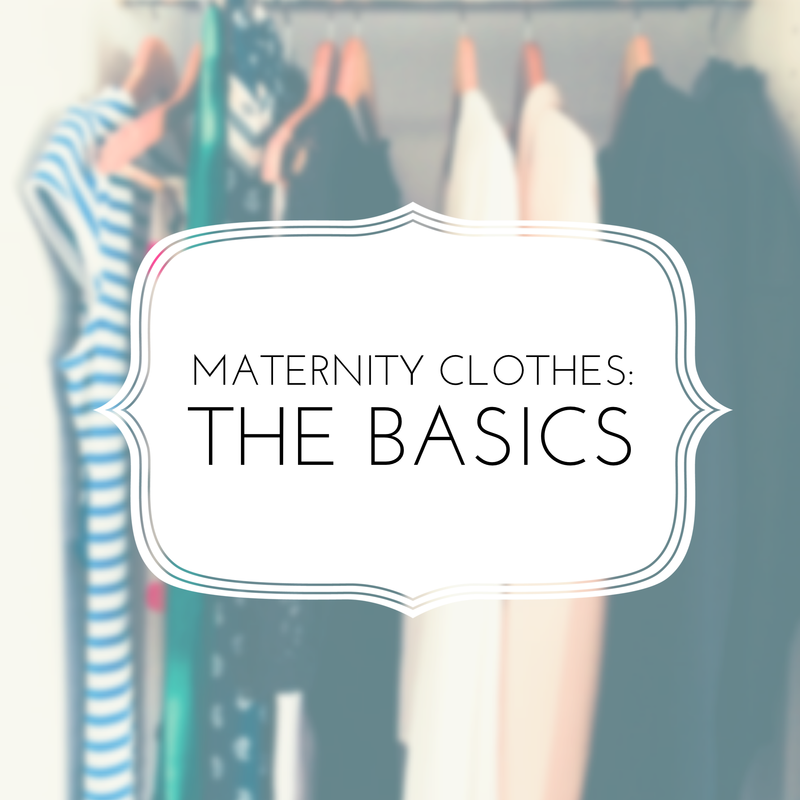 These are the basics – the building blocks of a casual maternity wardrobe. They’re items I’ve worn during all of my pregnancies and that I’ve invested in or replace with each baby. It’s taken me three pregnancies to figure this stuff out, so here goes…..
1. If you’re tossing up between two sizes, buy the larger one as you will definitely get bigger. Most maternity ranges recommend buying your pre-pregnancy size, but you may need to go up a few sizes – take down your measurements before buying online (and retake them if you buy clothes online at a later date, because you will keep growing!) Too-small jeans will fall down and too-small tops will ride up. Remember, size is just a number. Don’t get hung up on it. 2. If you’re reluctant to buy clothes that you’ll only wear for 6 months, remember that you’ll probably wear most of them right after you give birth, as well. Your uterus takes up to 6 weeks to shrink to its pre-pregnancy size, and it can take much longer to lose any extra weight you put on. I wore maternity jeans for six months after giving birth the first time around! 3. Nothing that you buy has to be from the maternity department, as long as it fits well and you look and feel good whilst wearing it. eBay is a good option for little-worn second-hand maternity clothes, especially more expensive items like cocktail or formal dresses, as most women won’t get a lot of wear out of them. 4. …That being said, you could be breastfeeding for another 6 months, or a year, or 2 years, so a maternity dress that you can feed in and is flattering on post-baby bodies can be invaluable. Nursing bras are also worth the investment as you’ll wear them long after giving birth. And of course you’ll wear maternity clothes again if you have more than one baby! A well-fitting and supportive bra is always important, but never more so than during pregnancy. Your breasts can grow several cup sizes and might be one of the first things you grow out of. They’ll also become a lot heavier, so support is vital. I’ll write a separate post on these, but my favourites are from Hotmilk and Triumph. I wear these all the time anyway, but a tank can prolong the life of your regular tops as they become too short and also disguise the hairband holding up your jeans – and even some maternity tops aren’t long enough, so these are important! Look for something that is several inches longer than the waistband of your jeans to ensure it will stay put and survive the third trimester. I usually buy mine from Target in black + white, since they come in around the $12 – $15 mark and something I don’t mind replacing. 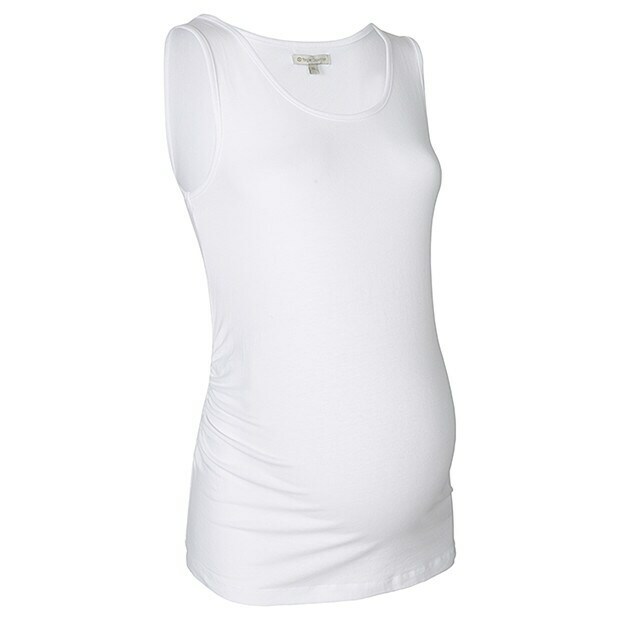 Extra-long tank tops from a non-maternity range work well, too, or you could try a belly band for the same purpose. (This one is suitable for both pregnancy + nursing and comes in 8 different colours! I own the pink marle and it’s proved very comfortable so far). I wear these almost every day as a SAHM, but you may only need 1 or 2 pairs for the weekend depending on your work situation. They come in three basic styles – over, under and mid-bump. I’ll write a whole other post on these, but my favourites are from Ripe Maternity and Queen Bee. Although it doesn’t have to be black. What I’m talking about here is a flattering dress, in a solid colour for maximum versatility, that you can wear to a range of events – date nights, weddings, your baby shower, without being too formal. Something you can dress up with a blazer and heels or wear with sandals and a long necklace to a family lunch. 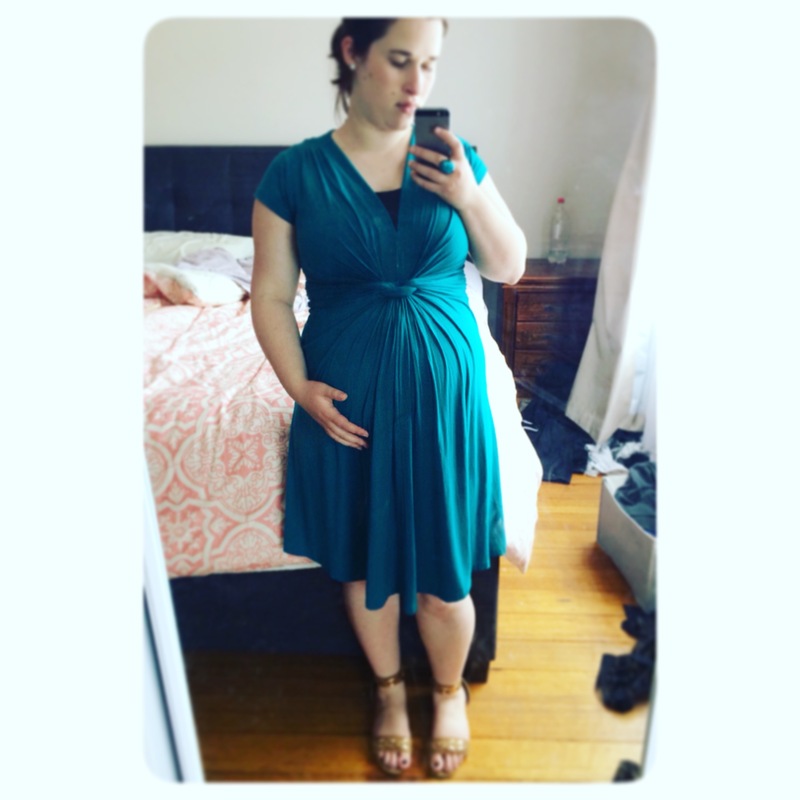 I try to spend very little on maternity dresses that aren’t breastfeeding friendly, as they’ll have such a short shelf life (unless you wear them to work on a regular basis). I’m strictly against wearing leggings as pants (at least in public :P) but they can be invaluable during pregnancy – worn with a t-shirt and long cardigan or kaftan, or under dresses and tunics during cold weather, or for wearing at home when you just can’t get comfortable in anything else and want a step up from pj’s! I also exercise in mine (which, I admit, doesn’t happen very often…) and an under-bump style will work while you’re in hospital and for the weeks after you give birth where comfort is key. (Mid bump styles don’t tend to stay up.) I bought an expensive-ish pair during my first pregnancy and have worn them ever since – and they only just need replacing now, almost 3 years later. I’ll write another post soon on some of my favourite pregnancy looks and how to build a functional maternity wardrobe, incorporating these items + clothes you already own. So you never have to say “I have nothing to wear” again…..
What about you? What are/were your favourite clothes to wear during pregnancy?